When I turned fifty, my children threw a surprise party. The celebration was complete with streamers, punch, cake, friends, family and pin-the-tail-on-the-donkey. My girls let out one of my secrets. I had never owned a matching set of dishes. So all the precious gifts were red Fiestaware. Fiestaware just screams party, even when it’s just me having a bowl of soup. Even though matching dishes, didn’t rate high on my priority list, I do occasionally pick up something that is just fun and compliments those pieces. 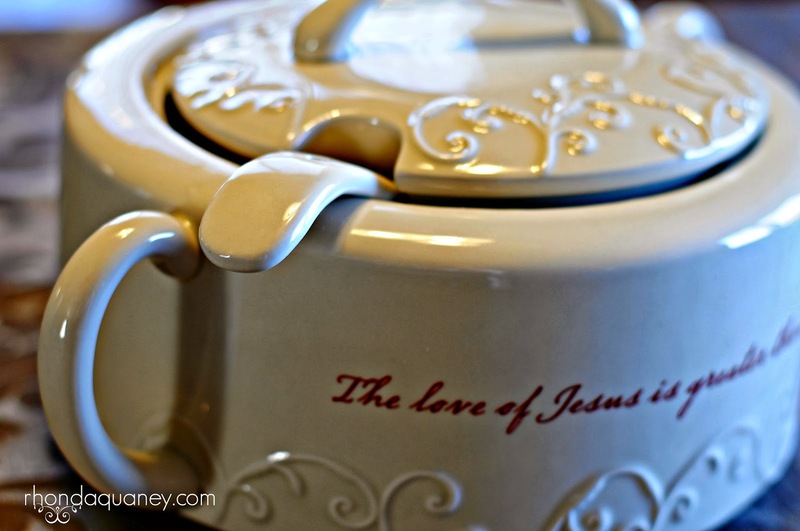 Recently I purchased this soup tureen from daysprings.com. It was already an amazingly low price, but purchased with some other gifts I received an additional discount that made it about $12. Yes, I bought myself a gift. Well now you know how I am. I do love the reminder, that Jesus is the greatest gift and that there is no greater Love. As the temperatures here dip low and the days are lived out with too many things to do, I pulled out one of my family favorite recipes. The original recipe is from a long-time friend, Annette Woodhead. We did some life together while homeschooling our children. She blessed our family by sharing her gifts of sewing, taught my oldest daughter to how to play the flute, and sharing some of her survival secrets. This recipe was one of them. It can be assembled quickly in a crockpot and run out the door. Major tip. Make supper by lunch time. You can do this! While you don’t have to let it cook all day, it does just get better and better as the flavors simmer. I have lost the very original handwritten recipe, but I remember Annette saying you could use six cans of any kind of beans you have on hand. So go to your pantry or wherever you keep the canned goods and dig out what you have. That’s the great part of soup and specifically chili isn't it? This is basically how I make Taco Chili. I do confess that I don’t really use a recipe for much of my cooking, but if I did, this is how I would do it. I'd add chopped green peppers too if available and saute them with the hamburger. Also I like to blend whatever kind of tomatoes. I also place seasonings in blender. You don’t have to, but I personally like it that way, probably because we most often use our own garden tomatoes that were frozen whole. My family likes cornbread served with this, but I’ve also served this cooled over a salad, for the best taco salad you have had. So.… even if you don’t have a fancy-smancy soup bowl, make your day warmer by having this tried and true taco chili. And remember too, there really is no greater love then Jesus, so take ten minutes to start your day with Him. He loves you so. Would you tell me? What is a recipe you go to for those cold and crazy days?